"Sampath Speaking" - the thoughts of an Insurer from Thiruvallikkeni: India beats NZ in T20 at Kotla ~ Ashish Nehra retires. India beats NZ in T20 at Kotla ~ Ashish Nehra retires. At Kotla, India won – outsmarting visiting New Zealand in all departments – yet lot would be written about this man, whose 2nd delivery in ODI removed Alistair Campbell and in Tests had Maravan Atapattu in his debut match. Today, at Kotla, Rohit Sharma and Shikhar Dhawan were so casual that in the initial stages, it appeared to be an old-time one dayer, yet runs keep flowing – 158 of them, becoming the highest partnership for India and the third highest for any team in T20s. The highest is an unbeaten 171 by Martin Guptill and Kane Williamson versus Pakistan last year. Down under there is news that aussie pacer James Pattinson may soon be flying to New Zealand for surgery unprecedented in Australian cricket history - the same procedure that helped extend the career of the former New Zealand spearhead Shane Bond, which has also been undertaken by Matt Henry. Kiwis for sure would not be relishing that assault that set 203 as target. Dhawan and Rohit both missed their centuries by 20 – and in the end New Zealand could muster only 149/8 in 20. There were sixers galore and in the final over Virat hit one and crowd went delirious as Mahi Dhoni lifted the first ball he faced for a huge six. Earlier when Rohit was on 80, he was given out caught behind to a wide Yorker – before he moved out, the third umpire was asked to check if the edge hit the ground en-route to the keeper. Bizarrely, Anil Chaudhary reversed the on-field decision and soft signal of out, adjudicating that "bat hit the ground" without sufficient evidence. Kiwis went for a review, and had it overturned. Confused expressions abounded all around the Feroz Shah Kotla. With such a mammoth score the chase was never on. In the second over, Yuzvendra Chahal had a wide long-off because the ball spinning away tends to go squarer off the outside half of the bat. Martin Guptill, though, managed to hit Chahal straight back over his head. Hardik Pandya ran around to his right, but as he realized he wasn't going to get there, he put in a full-length dive, both feet off the air, and plucked a two-handed stunner that is every wide receiver's dream in American football. As India prospered, the team had picked that extra-bowler the characteristic Ashish Nehra who had earlier announced his retirement. He did bowl well but could not pick up a wicket and bowled the last over of the match. Here too it was an event as he was bowling from his own end ! 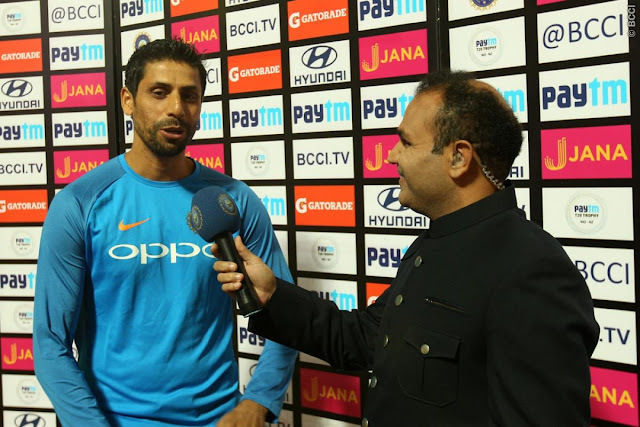 - paying tribute to the retiring Ashish Nehra, the Delhi District Cricket Association (DDCA) on Wednesday named one of the playing ends at the Feroz Shah Kotla Stadium after the veteran seamer. Nehra became only the second bowler in international cricket, after England paceman James Anderson, to bowl from his own end. Nehra the gentle bowler would he remembered for his incisive spells and smiling face. Owing to prolonged injury worries, Nehra could not take more than 44 wickets in Test cricket in 17 matches. His limited overs career record has been far more impressive with 157 wickets from 120 ODI matches, besides 34 scalps from 26 T20 Internationals. He made his debut in Feb 1999 at Colombo and thus his International career has lasted for 18 long years ~ the last time he played a test was in 2004. His ODI debut was against Zimbabwe in June 2001 at Harare and he played in that WC 2011 game when India beat Pakistan ..